Traditionally, proteins were identified by de novo sequencing, notably via the Edman degradation. As the protein databases grew, correlating experimental information with the information in sequence databases provided a faster means of identification. Mass spectrometry provides a set of weights of protein fragments which can be compared to existing sequence databases. This procedure, called mass mapping, is a very effective means of identifying proteins. This method described here is not effective to find the composition of an unknown protein (a separate field of study), but it is effective in locating an unknown sample if its sequence is recorded in a protein database. For a review of the use of mass spectrometry in proteomics, see Chem. Rev. 2001, 101, 269-295 by Aebersold and Goodlett. 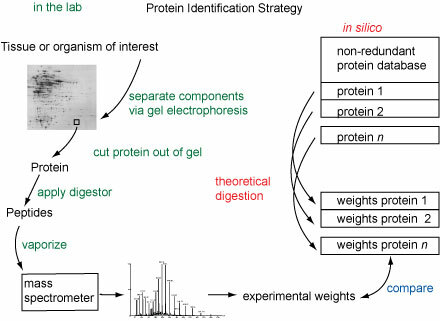 The problem of identifying a sampled protein can be reduced to digesting the protein with an enzyme, finding the molecular weights of each of the pieces (in the lab), digesting in silico each of the proteins in a database to generate for each protein a list of theoretical masses, and then comparing the experimentally measured weights with the theoretical weights of the proteins in the database. The process can be repeated with several different enzymes to increase its selectivity. The purpose of this biorecipe is to describe an algorithm to perform this matching against the database in an efficient way. Secondly we are interested in estimating when a match of weights is significant. This algorithm is available in Darwin under the name SearchMassDb. Readers interested just in its use should skip to the example section. The next sections describe the algorithm and its theoretical basis. (a) The recording of molecular mass is subject to a relative error, in general less than 1% but not exact enough as to identify even very short sequences of amino acids. (b) Two of the amino acids, leucine and isoleucine, are composed of the same atoms and thus have identical weights. In addition, Lysine (molecular weight, 146.1740) and Glutamine (molecular weight, 146.1310) have very close molecular weights. (c) The searched sequence may not be verbatim in the database, although maybe a close relative of the sequence is. In this case the searched sequence and the target could differ due to mutations, insertions and deletions. This will cause some molecular weights to be different. (d) The mutations in the database sequence can cause the digestion to be different, splitting into more or fewer fragments. This will cause a complete mismatch of weights involving such fragments. (e) Impurities in the sample and in the digestors may produce spurious data in the searched sample. (f) The fragmentation (digestion) although in general accurate, is not 100% deterministic. Partial digestion or incorrect ones are also possible. (g) The mass spectrometry measures are subject to systematic (biased) errors due to calibration. For all these reasons we have to use a matching method which will tolerate errors both in the sample and in the database. (i) Find a set of molecular weights of the digested protein (usually found by experimental means). (ii) Digest (theoretically) every sequence in the database and find the molecular weights of the fragments. (iii) Compute the probability that a match of the given weights against the computed ones happens at random. (iv) Record the m lowest probabilities. This algorithm returns the m most likely candidate sequences from the database. Analysis of these sequences and their probabilities will normally reveal whether we have found a match, a hint or just random noise. In this section we will derive the formulas to compute the probabilities which will be used in determining the most significant similarities and finally to determine whether these similarities are significant or not. First we will abstract the problem in the following way. Suppose that we select small intervals, each one of length in the range 0 to 1. Suppose that is small enough so that we can distribute the intervals almost at random without a significant danger of overlapping them. We have now of 0 .. 1 covered and uncovered. The second step consists of choosing random points ( ) in the unit interval. We want to determine the probability that all the intervals receive at least one of the random points. Alternatively we could think of a unit area and small boxes randomly distributed in the unit area, each box with area . We now throw balls randomly in this area and we want to compute the probability of ending with at least one ball in each box. To compute the probability of this event, we use generating functions. is a generating expression of all the events of this experiment, where corresponds to an ball in box and corresponds to a ball outside all the boxes. For example, the coefficient in of gives the probability of two balls falling in box 1 and all the rest falling outside all the other boxes. The coefficient of gives the probability of all balls falling outside of all the boxes. For practical purposes the most significant term, , is an excellent approximation for the probability. If we have weights from a sampled protein and we match them against an unrelated digested protein which splits into fragments, we can view the weights of these fragments as random. If the weights were from a totally unrelated protein, they could be viewed as random values in the given range. Lets assume, for the above example, that the weights were selected in the range 400 to 1500. We can now establish an equivalence between this example and the previously computed probabilities for each of the entries in the table. For example, the second line corresponds to hitting one interval with radius 1 out of 5 random choices. The third line corresponds to hitting two intervals each one within radius 6 out of 5 random points. Before we compute these probabilities with the above formulas, we need to consider the nature of error in molecular weights. These errors are not of an absolute magnitude, rather they are relative to the mass we are measuring. I.e. an error of 1 for a mass of 1000 is equivalent to an error of 10 for a mass of 10000. Since our probability was derived on the assumption that all the intervals were of the same length, it is easiest to apply a transformation to the masses, such that a constant relative error becomes a constant absolute error. In terms of our example, an error of 1 for the mass of , 441 would be equivalent to an error of for for the mass 1415. A standard transformation, when we want to linearize relative values, is to use the logarithms of the measures. So instead of working with the weights, we will work with the logarithms of the weights. A tolerance of in the logarithms is equivalent to a relative tolerance of in the relative values. This is valid approximation for sufficiently small . Finally, since our intervals in the theoretical derivation were based on random variables distributed in (0,1), we must make the relative errors relative to the size of the entire interval, or divide them by where and are the maximum and minimum weights that we will consider in the sample. Note that is twice the value of the corresponding radius of error. Surprisingly, even though is very close to , the event which considers both and at a greater distance, is 10 times more rare than the match of alone. We have now all the ingredients for our algorithm. For each protein in the database we compute its digestion in, say, fragments, and the weights of these fragments. For each searched weight we find the minimum distance to one of the database weights and set . Then we order the distances in increasing values . For distance , weights are within distance of database weights. For each we compute . The best match is considered the for which is minimal. This probability identifies the database sequence. is the score of the match with this database sequence. Finally we keep track of the lowest probabilities or highest scores ( usually between 5 and 20) for all sequences in the database. This function will be called SearchMass and receives as parameters a set of weights, a function which does the digestion, as shown earlier with DigestTrypsin, and the value IT(m). Instead of working with probabilities directly, we will work with the logarithm of these probabilities. To make these measures similar to the similarity scores of alignments, we will compute -10 log10 p. This measure will now be comparable to scores obtained from alignments using the standard Dayhoff matrices. The above function is implemented in Darwin's kernel with additional generality. The main reason for having it in the kernel is to compute faster. The kernel function is also able to handle DNA searching, many predefined digestors and changes to the molecular weight of amino acids. It is useful to see its description and to see the list of digestors supported. (one or many) weights resulting from digesting the protein with an enzyme. modified amino acid weights. See Protein and DigestionWeights for details. the matching protein. See MassProfileResults for full details. (Baker's yeast). Unmatched weights: [1512.5]. 60.0  7 3 Q43284;  Oleosin 14.9 kDa. Arabidopsis thaliana (Mouse-ear cress). 58.2  6 3 Q9FC39;  Protein crcB homolog 1. Streptomyces coelicolor. other amino acids may occur. of other residues which will adversely affect the search. protein and are therefore not useful for searching. not of great practical use. (101.1054) or homoserine lactone (83.092) is produced. cirratum (Nurse shark). Unmatched weights: [511.3, 563.1]. (Fragment). Arabidopsis thaliana (Mouse-ear cress). Unmatched weights: [511.3, 836.4, 1014.4, 1169.4, 1509.7]. 82.2 12 6 Q9RH74; Q89K47;  SsrA-binding protein. Bradyrhizobium japonicum. Unmatched weights: [836.4, 1014.4, 1387.5, 1509.7, 1524.0]. [563.1, 717.2, 836.4, 842.5, 1387.5, 1509.7]. The above results are typical of a successful match (the top one representing a probability of 1e-16 of being so good by random chance) followed by matches which are in the noise area (probability of 1e-8 which is on the order of the size of the database, fewer weights matched and no consistent name of the matched protein. 159.3941. Hence we can conclude that the weights 511.3, 563.1, 717.2, etc. come from the digestion of the fatty acid-binding liver protein of sharks or similar sequences with a very high likelihood. (vi) search the database with the weights of the two digestions. Darwin issues a warning when a procedure is reassigned. The procedure DigestTrypsin was assigned at the beginning of this biorecipe. Calling DigestWeights here forces reading of the entire set of functions related to molecular weight including the library version of DigestTrypsin. Thus it is reassigned and a warning is issued. hydrolase). Myzus persicae (Peach-potato aphid). Unmatched weights: [726.0, 767.0, 817.0, 944.9]. Unmatched weights: [791.0, 1166.0, 1244.4, 1373.0]. protein LMX1B) (LIM-homeobox protein 1.2) (LMX-1.2). We can see that the desired protein was found, although due to the small number of matching weights, noise and additional weights, the match is at the same level as the other irrelevant matches. This was made a limiting case on purpose, to show what happens when the weight information is barely enough. If we would repeat this experiment with at least one more matching weight, the results would be unambiguous. (vi) search the database with the weights. uroporphyrinogen synthase 1). Streptomyces coelicolor. 108.9 19 4 Q06650;  Beta-lactamase precursor (EC 3.5.2.6) (Penicillinase). 660.7, 1153.0, 1220.0, 1355.0, 1382.5]. [656.8, 906.0, 1153.0, 1220.0, 1355.0, 1408.7]. We can see both desired proteins were found with the scores better than the other matches although the score of the second match is approaching the noise area.